Looking back at the projects that I have done so far this semester, I think it would be difficult to continue either of them. Especially the first project, which was to me the more interesting of my two projects, is pretty much impossible to continue as I interviewed a performer who was on campus for just one day and likely isn’t coming back. I think, therefore, that I will be doing my project on something new. 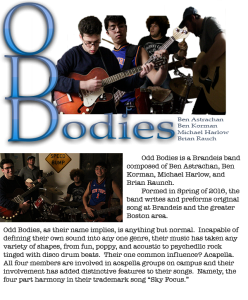 Recently, I was invited to like a facebook page for a band called Odd Bodies. 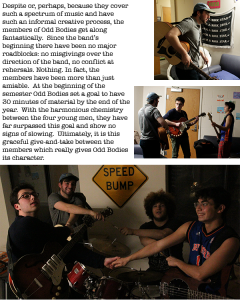 This is a Brandeis based band and, as it turns out, I know at least one of the members of the band. I have reached out to them to see if they would be willing to be involved in the project and, although they have not yet replied to me, I am hoping that they will get back to me shortly. For this project I would be able to shoot video interviews of the different band members and likely discover the stories of (a) how they became a band and (b) how each member learned their instrument and is involved with the creative process (they write their own songs). The video and photos would likely be a combination of both the band performing or practicing as a whole as well as band members in individual practice or interview settings. Should they reply and tell me that I they would not be willing to participate I would return to my volleyball project. I have a considerable amount of B-roll and video already. As their season is drawing to a close at the end of the semester, though, I doubt their practices will continue past next week, this is certainly not ideal. I think I’d be way more capable of working with Odd Bodies than the Brandeis Club Volleyball Team, however I’m trying to keep my options open at this time. The Brandeis Men’s Club Volleyball team is going through an exciting and unique period after more than ten of their players graduated last year. Once a championship team they were reduced to just 5 returning players, not even enough to field a side. How are they hanging on and how has the loss of these players effected their goals as a team and their team dynamic? Watch to find out! Deca, a rapper, artist, and producer visited Brandeis campus several weeks ago to perform at Chums. He kindly set aside some time to interview and tell us about his life as a rapper and producer. As his career is beginning to take off, he talks about both his creative processes and how he supports his music. My two main ideas for this video project are to do a short piece on a play happening on campus or the Brandeis Football Club. One of my friends is very involved with theater on campus. I think he is directing a play this semester. Therefore I think I might ask him if I can attend some rehearsals or if he could put me in contact with other people who are in charge of plays on campus. I would interview him or these people about how the play is going, artistic choices the director makes, and more. I could draw out a story about how a play is made and specifically about how important directors decisions are made. Another thing I might do is do my project on Brandeis Football (Soccer) Club (BFC). BFC is the Brandeis club soccer team and has an interesting position on campus because of the school rule which does not allow club sports for sports which are also varsity sports. Therefore BFC is classified as a club rather than a club sport, causing them to have low priority on field time as well as less access to school funding. I would talk to the coaches and captains of the team about how the are working to resolve this problem, why they think club sports are important, and how the current rules limit them. I would take video of them at practice. Now that we are 3-4 weeks into this class I am beginning to feel more and more confident using the camera. This is good because the first project is coming up quickly. This project will combined photos I have taken and an interview into a short presentation a few minutes in length. I have two ideas for this project in my head right now. Firstly, I have been thinking about doing the project on a band that WBRS is bringing to campus. WBRS is bringing two bands, GDP and Deca, to play at Chum’s on September 24. I know a couple people at WBRS and was hoping that I could use my connections to talk to the band for the interview for my project. However, this might not be possible in which case I would likely interview people at WBRS about their experience there and their background or interests in radio and/or music. For the pictures that would go along with the interview I would take pictures of the bands as they play on September 24. This would be a really cool experience for me because I’m really interest in music and learning more about band’s and their backstory. I could ask the band about how they got started, what kind of struggles they have gone through to make it as a band, how they all met, and where they plan on going next. If I can’t interview the band then I would instead interview someone at WBRS and ask why they were interested in a particular band, what they thought of the performance, why they got involved with WBRS, and what they plan to do with/at WBRS in the future. I think this is a newsworthy story because this band is coming to campus and people will get a better idea of this band by listening to their backstory and their lives. My second idea is interviewing a friend of mine from high school who came to Brandeis this year and is playing for the Women’s Varsity Basketball team. In interviewing her I would be able to ask about the Varsity/college experience as seen through the eyes of a freshman. I would ask her how her life has changed since high school, what is different about Varsity here at Brandeis that it was in high school, how she balances her schedule, and how she plans to spend the rest of her time as a student athlete. In addition to talking to her I could also probably talk to her coach or a team captain and ask their views on being a student athlete and how student athletes grow over their time at Brandeis. I think this is a newsworthy story because it offers and inside look at a part of Brandeis which some people don’t often get to see. In terms of photos I might go to a basketball game or practice to get photos of my friend playing basketball. Hi! I’m Ryan and this is my blog for Multimedia Storytelling. I’m a sophomore here at Brandeis. I write for the News section of the Brandeis Hoot and have joined this class in order to get a better understanding of all the different parts of what goes into the news and reporting. I am interested in learning a new skill set which I can apply to my experience in Journalism. For the most part my interests in Journalism are mostly in news writing. I think it is important that the news is reported properly as it informs the citizens and wrong or misleading information can mislead citizens. Outside of news writing, though, I have interests in soccer, swimming, and the arts. Therefore, I might at times move my journalistic interests towards sports or the arts. My main idea for an on-campus story right now is the castle. I know that the castle is going to be taken down soon but I feel that there are still a lot of questions surrounding the process of how this going to be done and where students will be moved. I also, though, have been thinking about the event that took place last year, Ford Hall 2015. This is probably a more interesting thing to think about, in terms of multimedia, as there is more visible action to be captured happening in this than in the castle. I expect there will be continued rallies and events after last years Ford Hall 2015 sit-in and I am interested to see how things will advance. As for an off-campus story, I am really interested in exploring climate change and the effects on the local area. I come from rural Vermont where everything is pretty green so being in and around a city as big as Boston is often a surprise and I feel that I often recognize things (such as litter or visible pollution) which others may not. I often wonder what kind of effects the city has on the local environment and what can be done to protect the environment.